That's literally. If you're big into Japanese food, but are still somewhat curious as to how you get the California into the California roll then Shaberu! DS Ryouri Navi —aka the Talking DS Cooking Navigator—may be just what the master chef ordered. 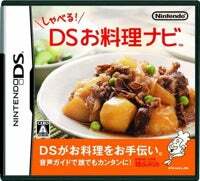 Containing over 200 Japanese recipes (including pictures), the DS cart provides you with each step of making a dish. When you verbally assent to having carried out that step, it provides you with the next step. The downside is that, of course, the program only exists in Japanese right now. Still, if you happen to know the language, but just lack the cooking skills, you can pick up a copy for around $35.